ATLANTA, GA--(Marketwired - Feb 13, 2015) - Starpharma Holdings Limited (ASX: SPL) (OTCQX: SPHRY), a company that researches, develops, and commercializes dendrimer products for pharmaceutical, life-science, and agrochemical applications announced today that Chief Executive Officer (CEO), Dr. Jackie Fairley will be interviewed live on iHeart Radio's Health Tech Talk Live hosted by Ben Chodor and broadcast nationwide on iHeart Radio/ Clear Channel Atlanta Studios - 640 WGST AM this Saturday at 3:00pm ET. In this exclusive double-segment interview, Dr. Fairley will discuss VivaGel®, the company's development of the world's first antiviral condom (the VivaGel® condom) which was recently launched in Australia by Starpharma's partner, Ansell. Dr Fairley will also talk about Starpharma's current US Phase III clinical trials of VivaGel® for the prevention of recurrent bacterial Vaginosis as well as its development of the clinical trial of the company's improved version of cancer drug docetaxel (Taxotere). The Company's product, DEP™ docetaxel is a dendrimer-enhanced nanoparticle formulation which is currently in a Phase I clinical trial in cancer patients. DEP™ docetaxel has shown a number of benefits compared to the commercial version of docetaxel, Taxotere® and this platform delivery technology can be used to improve other pharmaceuticals as well. Starpharma also applies its proprietary dendrimers to improve the performance of agrochemical products such as glyphosate (the active ingredient in Roundup®) and has a series of partnerships with leading industry players. Shareholders, analysts, industry professionals and all interested parties are encouraged to listen live via Clear Channel's nationally syndicated iHeart Radio stream. Starpharma Holdings Limited (ASX: SPL) (OTCQX: SPHRY) is an ASX 300 company and is a world leader in the development of dendrimer products for pharmaceutical, life science and other applications. Starpharma's underlying technology is built around dendrimers -- a type of synthetic nanoscale polymer that is highly regular in size and structure and well suited to pharmaceutical uses. Starpharma has three core development programs: VivaGel® portfolio, DEP™ drug delivery, and agrochemicals with the Company developing a number of products internally and others via commercial partnerships. Starpharma's lead products are based on VivaGel® (SPL7013, astodrimer sodium), a proprietary dendrimer. VivaGel® formulated as a mucoadhesive gel and delivered vaginally is under clinical development for the management and prevention of bacterial vaginosis (BV). Starpharma has also signed separate license agreements with Ansell Limited (ASX: ANN) and Okamoto Industries Inc., (TSE: JP3192800005) to market a value-added, VivaGel® condom. The VivaGel® condom is available for purchase in Australia under Ansell's Lifestyles® Dual Protect™ brand. Ansell manufactures and sells leading condom brands worldwide, including Lifestyles®, ZERO® and SKYN®. Okamoto is the market leader for condoms sold in Japan, which is the world's second largest condom market. In the wider pharmaceutical and life science fields, Starpharma has both partnered and internal programs in Drug Delivery. A number of dendrimer-enhanced, or DEP™ versions of existing drugs are under development. The most advanced of these is DEP™ docetaxel, a dendrimer-enhanced version of docetaxel (Taxotere®) which is in clinical development. In preclinical studies DEP™ docetaxel has shown significant tumour-targeting and superior anti-cancer effects across a range of important cancer types including breast, prostate, lung and ovarian tumour, when compared to Taxotere® (docetaxel). In agrochemicals, Starpharma has a series of partnerships with leading industry players, as well as internal programs including an enhanced version of glyphosate (the active ingredient in Roundup®). Starpharma's headquarters and research facilities are located in Melbourne, Australia. Starpharma principally consists of two operating companies, Starpharma Pty Ltd in Australia and Dendritic Nanotechnologies, Inc. in USA, both with a comprehensive intellectual property portfolio. Founded in 1996, Starpharma listed on the Australian Securities Exchange in 2000 (ASX: SPL). Starpharma securities also trade in the US under the American Depository Receipts (ADR) program, and are listed on the OCTQX platform (OTCQX: SPHRY). OTCQX is the premium tier of the US Over-the-Counter (OTC) marketplace, providing non-US companies with a visible cross-listing to access US investors, without the duplicative regulatory costs required of listing on a traditional US exchange. Jackie Fairley has 25 years of operational experience in the pharmaceutical and biotechnology industries working as a CEO since 2000. Prior to that she held business development, licensing and general management roles with companies including CSL and Faulding (now Hospira). In 2006, Jackie was appointed CEO of ASX-listed biotechnology company Starpharma Holdings. Under her leadership, the company has been promoted to the ASX300, has developed several new and valuable commercial applications for its proprietary polymer technology and signed a number of strategically important commercial deals with companies including Astra Zeneca, Okamoto and Ansell. Starpharma has also significantly strengthened its institutional shareholder base, attracting investment from major European, US and Asian funds. Jackie holds first class honours degrees in Science (pharmacology and pathology) and Veterinary Science from Melbourne University and was a practicing veterinary surgeon prior to joining CSL in 1989. Whilst at CSL she obtained an MBA from the Melbourne Business School, where as top student in her final year, she was the recipient of the prestigious Clemenger Medal. Jackie is also a Graduate of the Australian Institute of Company Directors. In addition to her role at Starpharma, Jackie has served on the Board of the Melbourne Business School since 2010 and sits on the Investment Committee of Mark Carnegie's Innovation Fund. She also sits on a number of specialist Government advisory committees. Clear Channel's Media and Entertainment division has the largest reach of any radio or television outlet in America with 243 million monthly listeners. It serves 150 cities through 850 owned radio stations in the U.S., as well as more than 140 stations in New Zealand and Australia. For more information visit: http://www.iheart.com/live/talk-radio-640-wgst-6066/?autoplay=true&pname=15153&campid=play_bar&cid=main.html. HealthTech Talk Live broadcasts live weekly on iHeart Radio / Clear Channel nationwide from 640 WGST AM Atlanta, 3:00pm - 4:00pm EST every Saturday. Host Ben Chodor interviews the front-page emerging health tech innovators and titans about the latest in digital health technology, human ingenuity, bio-tech medical advancements and health tech capital market trends. Learn how the experts use risk management techniques and clinical trials to build fully diversified portfolios and what it takes to put up big board earnings from making people healthier. It's a fast moving, high-energy show... shift your thinking and join us as we deliver "tomorrow's ideas today" on iHeart Radio and Clear Channel's HealthTech Talk Live. Visit iHeart Radio's HealthTech Talk Radio Show or visit www.HealthTechTalk.com. If you're interested in being a guest on HealthTech Talk Live radio show, please contact 1800PublicRelations at support@1800pr.com "ATTN: Health Tech Talk Guest Inquiry." 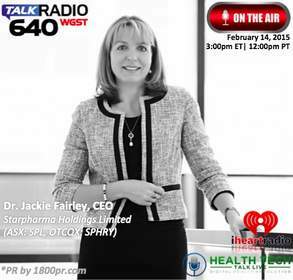 Starpharma Holdings Limited CEO Dr. Jackie Fairley to be Interviewed Live on iHeart Radio/ Clear Channel Atlanta Studios -- 640 WGST AM's "Health Tech Talk Live" on February 14, 2015. Public Relations and Marketing by 1-800-PublicRelations, Inc.